I fully intended to write up this tutorial months ago, but apparently time got away from me. I was reminded of it yesterday by a fellow blogger and I thought this might be a perfect time to share it. I selected red rick rack for the trim. 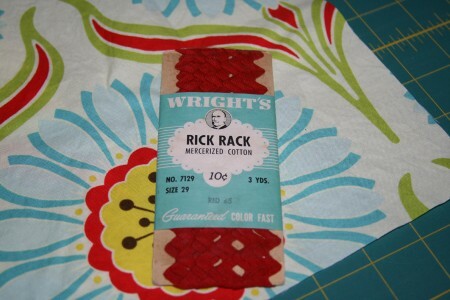 I’m partial to the vintage cotton rick rack if you can find it, but any would work here. If you are using vintage cotton, you may want to pre-wash the rick rack. I’m lazy, so I don’t bother pinning it, but if you’d like, you could pin the rick rack in place along the edge. I trim a bit off the end of the rick rack so I have a clean edge. You’ll want to make sure that you start with the cut edge facing the outer edge of your fabric, as seen below. 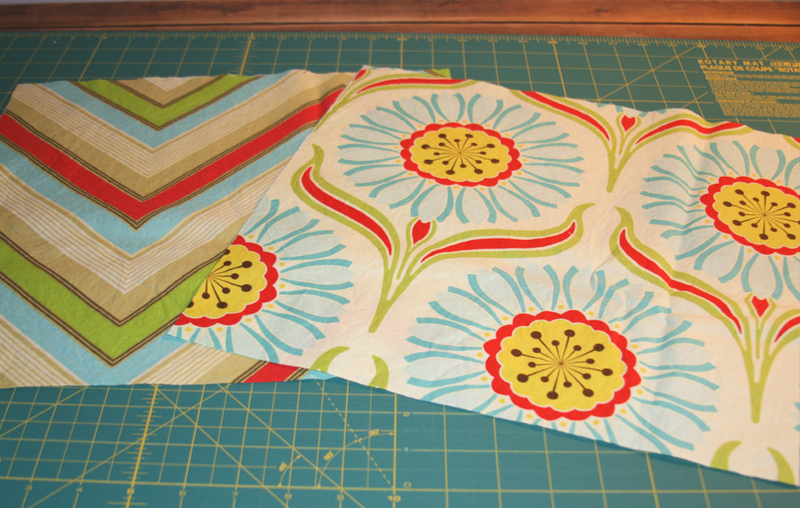 This way the cut edge will end up hidden when it’s sewn together. I start in the middle of one edge of the fabric and sew a straight line down the middle of the rick rack. 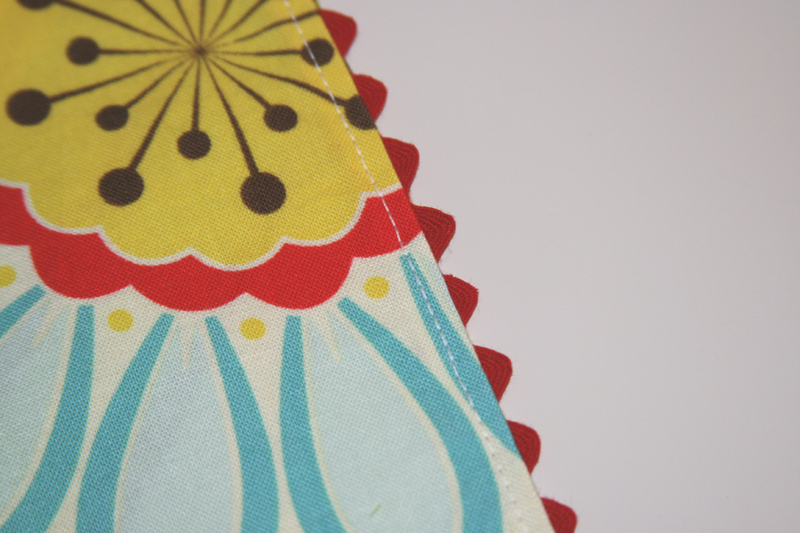 I position it so that the outer bumps of the rick rack are lined up with the edge of the fabric. When you reach a corner, leave the needle in the down position and turn. You’ll turn the rick rack as well so that it lines up with the next edge. 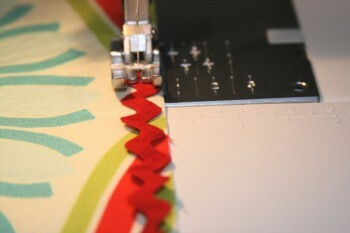 Overlap the rick rack where you started and backstitch to secure. Clip the corners, turn right side out, and iron the edges flat. You may need to pull on some of the rick rack points as you iron – this can help to make sure you get a clean edge. 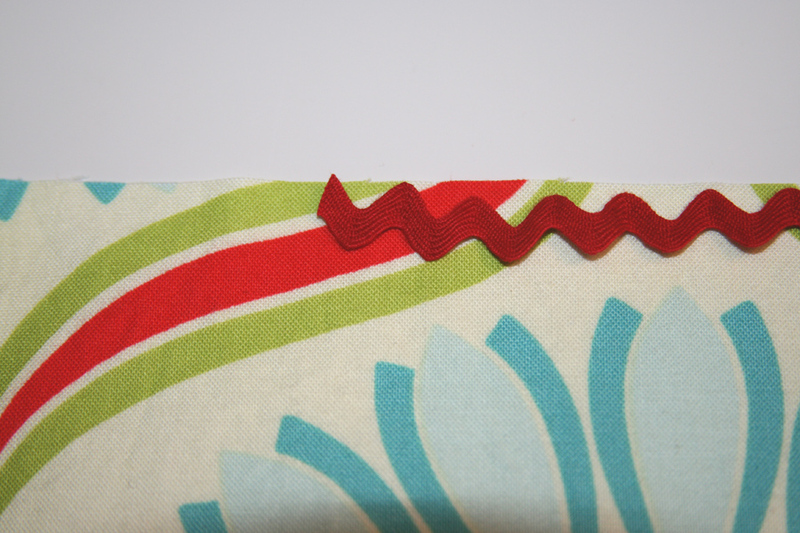 Make sure to iron in the unsewn section – this opening will be sewn shut in the next step. This is the last step! 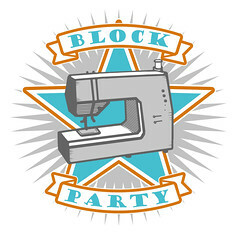 Simply topstitch around the entire napkin. This closes that opening and provides a nice finished look.Â You can even be creative here – I used a straight stitch, but you could use a zig zag, or any other decorative stitch you may have on your machine. And here you have your lovely completed napkin! 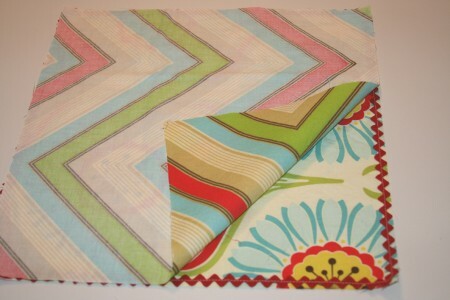 It can be folded any way you’d like – I like it as a square, with two sides of rick rack showing, or folded in thirds, with rick rack showing along the bottom edge. 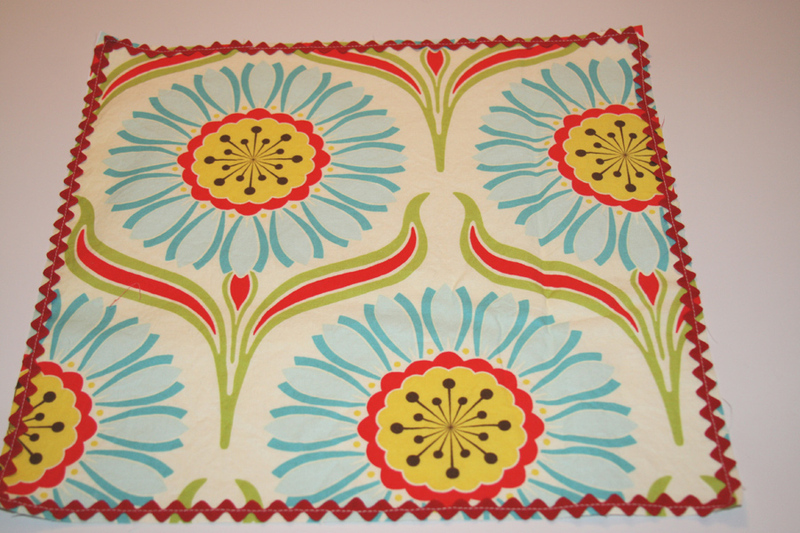 And don’t forget, it’s reversible! (though I should mention that I often make these using one printed fabric for the top and then a solid white for the backing. Both are quite lovely!) Enjoy! This entry was posted in Household Sewing - bags, napkins, pillows, Tutorials and tagged cotton rick rack, Fabric, handmade, heather bailey, Napkins, rick rack, rick rack napkins, tutorial, vintage rick rack. Bookmark the permalink. Oh these are so cute! What a simple idea to make a bunch of these for gifts! What a great idea, I can’t wait to try it! These are so great, I might have to find someone I could give them to! Ooooh, I love the rickrack trim! I made a set of “cocktail” size reversible napkins for my Mom for her birthday (the apron she’s getting for XMas is from the same fabrics). 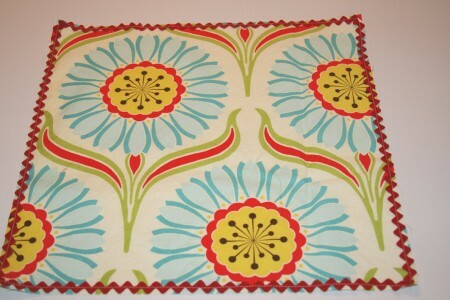 Next napkins I make will have rickrack, for sure. What a great tutorial! Thanks for sharing this with us. I like your tip about the size for the napkins so you can get three from the standard width. 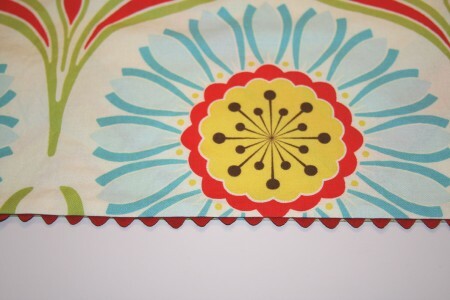 I have a small stash of vintage rick rack in odd colors, so this is a great way to use it. 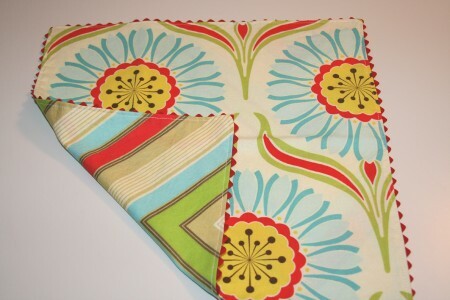 Love your items…..but how did you put the binding on the pot holders? this looks like a great gift! I love these! We’re an all cloth napkin household so these are great! I’ll be linking. You gave me a great idea! Thanks! I am going to play with this a little this weekend! I make napkins all the time but never with rick rack. Thank you for that. what a great idea. i had forgotten how cool rickrack was until i used it on my son’s halloween costume. it was fun to sew. what a cute napkin! 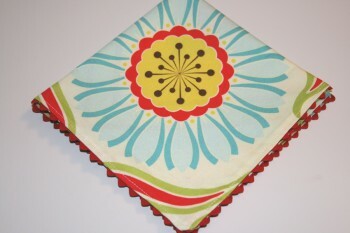 i have made napkins but never with the rick rack on the edges. Thank you for the rick rack napkin tutorial! I’m making them for Christmas gifts and they are alot of fun to sew. Saw these on sew mama sew and had to visit to see your work. So pretty! These are simply lovely! Thank you. Oo, thanks for this. I am excited to make some. I love that they’re reversible! I love these! I’ve been wanting to make these for a long time, but have been hesitant because I didn’t know how well stains would come out once the napkins are used. Does anyone have any tips for washing napkins to get all the food and lipstick stains out? Or do you just reuse the napkins again even if they have stains on them? I am in love with this!! I’m also thinking about doing it for placemats … with little people at home, they get so dirty so quickly. Thank you for this great tutorial! 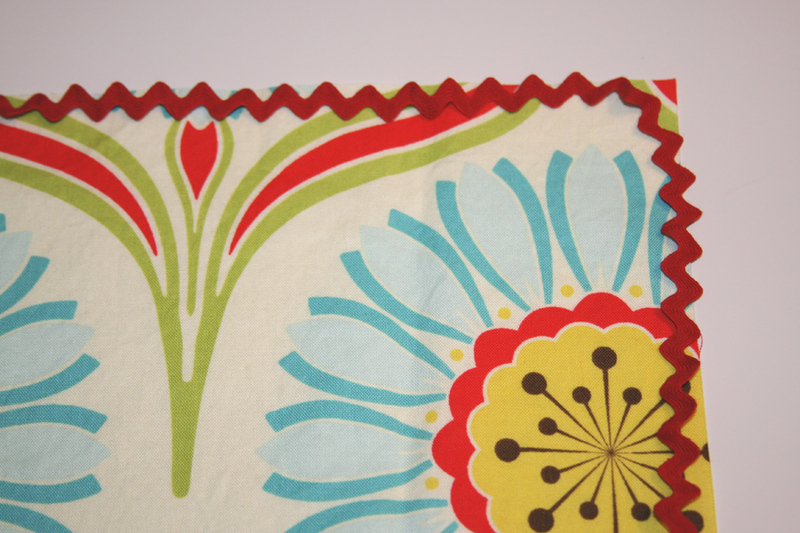 This is the perfect sewing project – easy to do, beautiful to behold! I just started sewing, and I didn’t think that I could do this project- but I was able to thanks to your great directions and pictures! Thanks for sharing this awesome tutorial! I CAN’T BELIEVE HOW CUTE THESE ARE!!! I ABSOLUTELY WONDERFUL AND EASY WITH THE STEP BY STEP INSTRUCTION AND PICTURES. Beautiful! 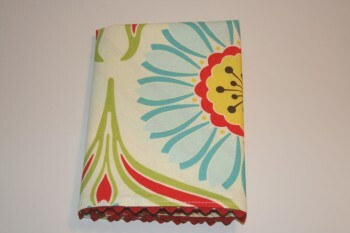 Our summer picnics in the park need these peeking out of the lunch pack! I have featured this post on my blog today! Great Tutorial, I’m adding it to list of Christmas projects. 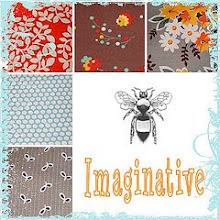 Hmm, do I have to fabric shop for them??? This is an excellent handmade gift idea and an excellent tutorial. Thank you. Thanks, Ashley. Having made bags and aprons for my sisters-in-law, I was at a loss for Christmas ideas. Napkins (serviettes to those of us north of the border) will be just the right gift. Now I just have to get busy. Any chance you have a tablecloth tutorial? It would make a great Christmas project/gift for someone. Thanks! So cute. Wow, these look so great, congrats! I am a total and utter novice with my sewing machine, but I’m going to give these a go 🙂 If they work, they’ll be a wonderful addition to our wedding 🙂 Wish me luck! By the way, what width of ric-rac did you use please? I love these with the rick-rack! I just made some napkins yesterday and was playing with ideas for edges. This is brilliant.